Coaches and officials interested in what training and support their sport provides should go to the website of the relevant NSO. National Sporting Organisations (NSOs) are responsible for the design and implementation of their coaching and officiating frameworks. 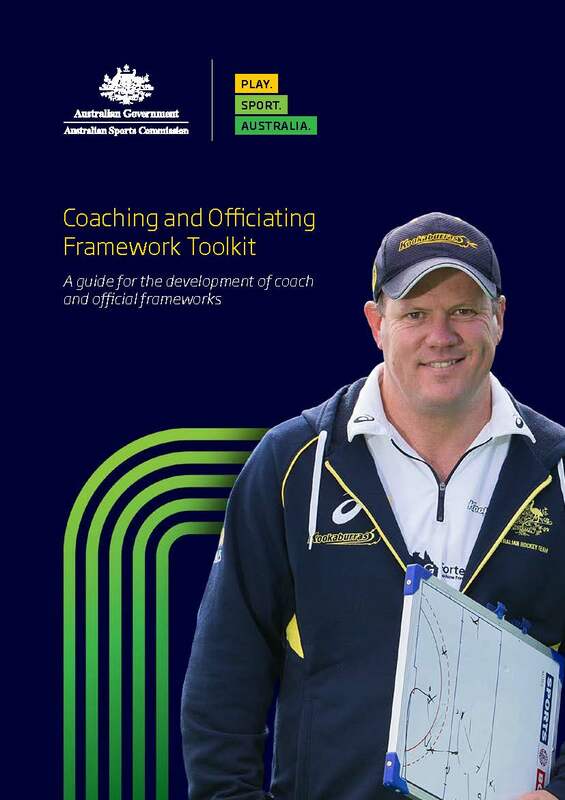 The Framework Toolkit is designed to assist NSOs to develop coaching and officiating frameworks. Sport Australia also conducts regular workshops with a range of NSOs that have been through the steps, providing the opportunity to enhance the final product through understanding the experiences of others. The Training Program Toolkit is part of a range of resources on this site that NSOs are free to use to supplement their frameworks. This toolkit represents a culmination of knowledge and best practice in coach / official education. There are six steps to help you design a framework. What is a coaches and officials framework? At its simplest, it is the homework you do before you design products for your participants, or develop training for your coaches and officials. It is what you do to ensure that they have the training and support they need to do their jobs well. provide coaches and officials with a clear map of training opportunities, professional development and career progression. Templates, case studies and other information to assist you have been included at the end of each step. Remember that all sports have different start and finish points, so these six steps might not work for your sport, or might work better in a different order. Remember that these are guides only, and are not compulsory. Use them as you see fit to meet the needs of your sport. The framework should be based on what you know about your participants. Think about ages, experience and capabilities, stage of development and the motivations and barriers for participating. Pathways and participation options should be developed for each of the different categories of participant. Ensure the options are challenging but within the reach of every participant. Example principle: Programs are delivered in a manner that is challenging to every participant, while ensuring participant welfare and enjoyment is maintained. The participant pathway map underpins and informs the training available, helping illustrate how coaches and officials can best meet the needs of participants. Example principle: Training ensures coaches and officials are well equipped to work with participants. For any group, be prepared to accommodate a range of participants by offering activities tailored for different abilities. Flexible participation means multiple points of entry and cross-overs, as well as participation options that are an end in themselves and not part of a pathway. Example principle: Flexible options are offered to provide participants with choices that meet their needs. Understanding the nature, distribution and number of participants is key to workforce planning. Example principle: Resources are allocated to coach/official training and support according to evidence based needs. It is important that sport needs to be accessible for all participants, including coaches/officials. This includes providing participation experiences accessible to all participants, and providing learning and educational experiences accessible to all who wish to be coaches and officials. Rather than developing a framework and leaving it on a shelf until the next registration is required, NSOs are encouraged to review the framework annually and make changes, additions and deletions as required. Example principle: The national coach/official committee will complete an annual review of coach/official statistics, course evaluations from participants and feedback from course presenters, and make any necessary changes to the frameworks and programs. Purpose: To develop a project plan that will guide you through the framework development process. The project plan will outline what has to be done, who does it, what resources are required to do it and when it will be completed. Some groundwork is required – collating and analysing existing systems and programs will inform the content. Your sport may have a committee structure responsible for coaching and/or officiating. People on these committees will have specific expertise that you can draw on and they will have some corporate knowledge and contacts that will be useful. Consider that some individuals probably were key players in the development of existing programs. Committee(s) will (or should) have Terms of Reference. Review these Terms; it may be that the development of a new framework is a role specified for the committee for example. An understanding of the committee and what it does will guide you in the way you engage it. There may be similar committees in your state bodies. It is wise to understand their roles and how they relate to each other and the national committee so that they can be appropriately engaged. Note that changes to frameworks and training programs will impact on the work of committees and might necessitate changes to individuals’ roles. This will need to be managed with sensitivity. Your sport will have a strategic plan, an operational/business plan and possibly plans for participation and high performance. All will (or should) have sections on coaching and officiating. Ideally, these documents will contain actions to review your frameworks, with timelines and allocation of responsibilities and resources. If this is not the case and the job needs to be done now, you will need to get support from management before starting this framework review. Consider not only the accredited training programs but also other training and learning offerings, such as mentoring, online learning, conferences and seminars etc. How the training is currently delivered is important to understand, along with the key people and their roles. How are your coaches / officials keeping up to date? Do your coaches and officials feel part of a ‘community’ in your sport? Are you using technology or other means to build a community? Any international federation courses or accreditations. Use any evaluations you have, e.g. surveys, course evaluations, course enrolments and completions etc. the results of any analysis are clarified and followed up as required. The need for change should be clearly articulated and supported with research: why do we need to change? What’s the problem that the current situation isn’t addressing? When examining solutions and options to solve the problem, the more stakeholders are engaged and encouraged to contribute, the more ownership they will have in the process. Members will need time to process and adjust to any proposed changes. There should be feedback mechanisms in place for each stage of the change process and all stakeholders should be asked, encouraged and asked again to give feedback. Use the WIIFM (what’s in it for me) principle. Put yourself in the shoes of your stakeholders – try and see the product and its implementation through their eyes. Will it make their job easier or harder? Will it diminish or augment their revenue? Will they have to change? Will the change cause people to lose power or status? Once you have everyone on board, a project plan needs to be developed. The big picture concepts should be easily described. A simple statement of where are now, where you want to go and why you need to change is critical. Consider your timelines, you may need to progress in phases, particularly if resources are a limiting factor or stakeholders need to managed sensitively. If resources have not been allocated in your sport’s operational plan, or your initial analysis suggests more or different resources, you will need to secure them before you start. There is reputational risk for yourself and the organisation if a project is started and is delayed or abandoned due to lack of resources. Committees: Do you need a new project-specific working party that has broad representation and expertise? Or will existing committee(s) be able to handle the job? Do the terms of reference or make up of existing committees need to change? Your time: Do you have sufficient time to undertake the project, given your range of other duties? Note that if your analysis suggests significant changes to the current system, this will increase your stakeholder engagement and time commitments. Financial: Make sure you budget for meetings, travel, software licencing and resource production. Workforce: What skills do you need for the job? What are the implications – immediate and long term – for the upskilling of your workforce? How will training be delivered, by whom and what upskilling will they require? External expertise: sport doesn’t always have the expertise or the capacity to undertake projects such as this themselves. In some instances, it is more cost effective for sports to engage an external consultant who can complete the project. Purpose: To understand your sport’s participants in sufficient detail so that coach and official training can be designed to meet their needs. Aim to develop a participation map showing the different types of participation in your sport. If your sport has an existing participation plan or a high performance plan, they will most likely include a participation map and you can move straight on to Step 3 Know your Workforce. However, you may need to revisit some parts of this step to determine current and targeted participant numbers, including breakdowns by state, gender or other factor. If your sport does not have participation or high performance plans in place, or those plans don’t have a participation map, then you will need to work through the following actions. Gather information from a number of sources to get a good idea of who your sport participants are, including numbers of participants, and their particulars (location, gender and age). At this stage, you should check for new programs and any targeted increases in numbers, gender or location. These potential changes will need to be considered in terms of coaching / officiating needs and capacity. For example, a modified sport program aiming to attract 5,000 new members, with an average of 8 members will need 625 community coaches who need to be recruited and trained. All sporting programs and competitions. Gather information about your NSO’s and SSO’s products, programs and competitions. Consider any other organisations (e.g.schools, social comps) that may be delivering products, programs and competitions for your sport. for NSOs. Look beyond traditional sports participation, and understand the motivations of people of all ages participating in sport, as well as people who have dropped out or who are less inclined to participate. types of programs (social, high performance, talent identification): the participation map diagram that we have included shows these kind of programs. the ages of participants: note that age doesn’t allow for differences in ability between those of the same age group. barriers and motivations: Sport Australia’s market segmentation research highlights what people like and dislike about sport participation. This has very important implications for training coaches and officials working with different participant segments. The nature of participation in each sport varies considerably and so each sport’s participation map will look different. Use the information gathered in the previous task to identify, at a high level, the different ways people participate in your sport. These broad categories can be called participation segments. Identifying participation segments will help you to develop training for coaches and officials that is based on the needs of these participants. Further reading on participant development pathways might assist you in this process. Identifying your NSO’s key physical, technical and tactical development benchmarks for each segment will ensure that training for coaches and officials match participant needs. Consider the implications for coaches and officials within each participation segment. What coaching / officiating support does the participation segment need? What are the differences and similarities? The participation map will help you develop training that is developmentally appropriate and matches the needs of your participants. The primary objective is to ensure coaches / officials are trained to respond to the needs of the participants they are working with. Understanding the capabilities and motivations of the participants in each segment will define the type of coaching / officiating required for particular segments and the training that they need. If your NSO has a participant development model consider the training implications for coaches / officials. Such a model will inform the skills required for coaches / officials working with the defined participant segments. Skills required of coaches / officials will most likely cover more than one participant segment, so consider directly matching your training levels to the participant map. Purpose: To build on the participant map to ensure you have a framework that develops the quantity and quality of coaches and officials to meet the needs of your sport’s participants. Understanding your coaches and officials is critical to appropriately target their training to meet their wants and needs. A survey of your coach/official workforce can easily be done through Sport Australia online ‘Coach Workforce Survey’ and ‘Officials Workforce Survey’. A generic survey question set has been prepared in Survey Monkey that can be readily adapted to your needs. Guidelines and tips for use are at Sport Australia Clearinghouse for Sport. Parents and participants can also be surveyed. Ask them about what they value in their coaches and officials, as well as any issues that may be present. Consider contacting lapsed or unaccredited coaches or officials. Sport Australias Clearinghouse for Sport has links to useful sources of information on community sport coaching and community sport officiating. What trends are there (e.g.demographics, gender, numbers, retention)? How long do they stay active in their roles? Are there issues in particular areas? We can see the numbers, but how good is the quality? Are there untapped sources of potential coaches and officials? By understanding your current coaches / officials and considering your sport’s future needs, you will be able to decide whether you have the number of coaches / officials necessary to meet your participants’ needs, and if they have the right skills to do the job. It is useful at this stage to guesstimate how many coaches / officials your sport needs – if it is difficult to do this for each participation segment, break it into states and add these up. You might find that you already have enough coaches / officials, or it may start you thinking about how you might attract and retain more coaches / officials. Develop a table like the table below for each participation segment you identified in Step 2. Accredited or non-accredited working alongside an accredited referee. The ability to manage a game that is conducted safely and flows freely. The ability to provide some latitude with decisions such as off-side and advantage is important. The ability to give encouraging feedback is important. Accredited or non-accredited, generally working in a team coaching situation. The coach will develop participant skills and ensure a fun, safe and inclusive environment. Coach will need to plan training sessions for skill development and fun, and be able to manage the demands of competition (player rotations, rules of the game, parents, spectators). One for every two teams, or less if they cover more than one game. Paid. The ability to manage a game that is conducted safely. Manage the game in accordance with the international rules One referee for every two games. Are there too few, enough, or too many adequately trained coaches / officials? Does our current training provide coaches / officials the right skill sets, or do we have some training gaps? Does our current training deliver any unnecessary information to coaches / officials? Is there a system for recognising and rewarding prior learning / experience? Are there mechanisms for maintaining ongoing contact with coaches / officials? Is there a need to target particular coach / official demographics? Does your sport need more female coaches, younger officials, or more officials in a particular state? Who will deliver any programs designed to meet your training gaps? Do you have a group of coach / official educators who can do this? This might be paid staff at a regional / state / national level, or it might need to be higher level coaches / officials. What training and support will your course facilitators need? Remember, these facilitators are the “face” of your program. A large part of the quality of a program will depend on their capacity to facilitate. If face to face training is difficult in some regions, consider other options. This could be working with another sport, working with State Departments of Sport and Recreation, or moving some of the learning online. What is our capacity for training and development? If we are delivering at maximum capacity now, what else can we do to best use our resources? Purpose: To provide an overview of the learning and development needs of coaches / officials. Before you get started developing your training plan, give some thought to the following concepts. If coaching / officiating children, clearance to work with children is required by law. The minimum requirements vary between states. Individuals must undertake the clearance process themselves, so make this clear. Different levels of coaching may require different minimum ages. For example, an under 8s sports team might have minimum coaching / officiating age of 16. However, this might not be an appropriate coaching / officiating age for an under 13s team, who would require someone over 18 years of age. In many circumstances, particularly at training sessions, there may be no-one around capable of administering first aid. Coaches and officials have a duty of care for the people they are working with so in all sports it would be prudent to make some kind of basic first aid training mandatory. In high risk sports, more thorough training and/or information specific to the sport should be considered. Similarly, duty of care includes taking measures to prevent injury. Injury prevention should be either incorporated into the various training programs or provided as a stand-alone. All sport should be conducted in an environment that is safe for their participants, coaches, officials and spectators. All coach / official programs should assist coaches / officials in managing the risk in their sporting environment. All coaches / officials should be made aware of the complaints handling process when they enrol in a course, and if they receive registration. This doesn’t require a new process to developed – it is just a matter of providing the coach / official with the relevant section of your sport’s Member Protection Policy. Learning is not limited to a classroom, a computer or the playing field. Learning might be through a webinar, watching someone else coach / officiate, through reading, or self-reflecting on coaching / officiating performance. Put simply, formal learning is assessed, informal learning is not. You may attend a workshop, take notes and learn a lot but not be assessed. In this case the learning is informal. You may attend a workshop, take notes, learn a lot and may be assessed as a coach / official based on the course content. In this case the learning is formal. Research recommends that developers of coach / official education programs should consider a range of learning opportunities, and that both informal and formal training has their mertis. Accreditation is what has been traditionally considered by NSOs. However this language has evolved to be similar to professional bodies, where many NSOs now refer to registration. Formal learning (such as assessed course, assessed on the job learning or post course assessment) and other requirements (such as working with children checks) will lead to a coach or official to being registered. Registration has minimum standards that a coach/official is required to meet in order to perform at a particular level. Registration has also has an expiry. Just as teachers, accountants and other professionals need to undertake continuing professional development to maintain the currency of registration, so too do coaches and officials. This varies between sports, but it is often a mix between formal and informal learning. This could be a graphic, table or statement that outlines the development for coaches / officials in your sport. A useful strategy is to prepare a high-level ‘conceptual’ graphic (or statement or table) and then add supplementary information for more detail. There is no requirement for a progressive pathway to training, rather the training should address the sport’s workforce needs and be presented in a way that encourages lifelong learning and continuing professional development. Deciding what training will lead to registration is something for the NSO to consider based on the sport’s needs. Avoid learning plans where the only option for greater coach and official development and recognition is to work with participants at a higher performance level. Many coaches / officials have no ambition to coach / officiate participants beyond their current level, but many will want to improve how they do their current job. Providing a range of formal and informal learning experiences can meet this need. Recognition of prior learning is what it says: recognising that someone already has the knowledge, skills and experience to be a coach. In the past, sport has borrowed from the industry training method of RPL. This has made the progress onerous and often harder than completing a course. It is a matter of finding a balance between a cumbersome process and maintaining the integrity of standards. If a qualified coach from another sport can be observed safely and successfully coaching a practical session in your sport, consider if they need to undertake any further training to be recognised. Use a mixture of formal and informal learning. Decide what areas of training you would like to use as part of an accreditation and how that could be integrated into an overall approach. Also consider training or support that can be provided to coaches aimed at improving the quality of coaching that may not lead to accreditation. Don’t forget: not everything needs to be a course! If you have some content that would be helpful for coaches / officials, consider making it freely available for them to access in their own time. Your international federation may also have coach / official courses and resources that can be integrated into your framework. There’s no need for sports to do all the training themselves. You might also consider courses from other providers, e.g. Australian Sports Commission, Play for Life, Sports Medicine Australia, or even other NSOs to be part of your coach / official training. Add to your overall learning plan (on the graphic or in an attachment) a clear set of statements about pre-requisites, the commitment required, whether up-dating is required, who the coach or official will be able to work with, frequency of courses, location of courses, RPL etc. Think of all the questions you would want answered if you were setting out to do some training. There is no silver bullet when it comes to participation maps and overall training plan graphics; each NSO's map will be different. A high-level shell for an overall training plan is shown. Notice in the second column that coaches and officials are grouped to match the participation communities. Also note that some detail has been added to this hypothetical example showing that the foundation coaches have one accreditation level and two formal non-accreditation training program options as well as signalling that there are other informal options (see the ‘other’ box in the last column). Your NSO plan will probably look different. The ability to conduct a session that is safe and flows freely. The ability to work with another community coach to ensure the game is safe and flows freely. The ability to give encouraging feedback is important. Accredited or non-accredited working alongside an accredited coach/game manager. The ability to provide some latitude with decisions such as off-side and advantage is important. The ability to manage players’. Frameworks and training programs are only as good as the system used to implement them. Below are some reminders of the practical things you may need to consider and Table 3 shows an example of how you might work through this process. Do you have a Board champion? Do you have strategies to generate ongoing revenue for continuous improvement? Is training a revenue raiser or a way of developing your sport? With your training plan established, it is time to identify training approaches within your budget. Develop a high-level overview of the delivery options for the training plan. This overview will provide a snapshot of the learning experiences for your NSO’s training. If this is something that you are still developing, show your best realistic guess. When you develop your training programs using the Training Program Toolkit you will be able to fill in any gaps. Think of this overview as a summary of what you are already doing and a wish-list of future learning strategies. You may hear people talking about coaching or officiating and using the term pedagogy. If you are about coaching children or officiating a game played by children, this term is correct. However, when we are talking about the education of the coaches and officials themselves, where the learners are mostly adults, the correct term is andragogy. This requires a different mindset. Develop a range of activities that allow learners to draw on existing experiences and solve problems that are meaningful to them. BUT! They need a valid reason. Let them know why they need to complete formal training, or continuing professional development. Coach and official education has traditionally been delivered face to face, but this is changing with the increasing prevalence and ease of use with technology. Due to the very practical nature of coaching and officiating, it is unlikely that NSOs could run a completely online training program, but it is possible to offer both online and face to face training in a blended program. Many NSOs are already doing this through the use of Sport Australia’s online learning portal to access the Community Coaching General Principles or the Community Officiating General Principles online. you don’t need to invest in expensive technology to develop online learning. Here have some suggestions and examples that demonstrate this. Just putting all of your content online is not online learning. It needs to be delivered in a way that encourages user engagement. Examples of effective online learning: - activities guide learners as they develop session plans which are later put into practice in face-to-face learning - understand coaching or officiating processes by looking at videos of coaches and officials in action responding to challenging questions and then demonstrating the key principles in a hands-on setting. KEY: Clear agreed objectives and clear feedback with an indication to the learner about where to go next is critical to creating an effective learning experience. Learning is about practising and reflecting. By definition these learning experiences are initiated by the individual coach or official. Your organisation may provide circumstances to encourage informal learning. * The online delivery option may be Sport Australia’s Community Coaching or the Officiating General Principles course, sport-specific online courseware, or a third party resource. How effective are your training programs? You won’t be able to answer this question unless you have systems in place to gather information about the effectiveness of your training. But for your courses to be effective in the first place, it is important to have a quality assurance program in place. This will help to prevent things becoming dated. Ongoing reviews and a system of gathering user feedback are keys to continuous improvement. Sport Australia strongly recommends that sports undertake an ongoing, continuous improvement process with the framework, reviewing it annually. Get immediate feedback from individuals or groups working in the new framework. There may be tweaks that need to be made immediately before they become significant issues. Schedule an evaluation of the new framework. This may be after a period of time or after a certain number of people have accessed the training. Establish a structure for ongoing oversight. This may be the responsibility of a committee, or individuals within the organisation, including yourself. Oversight may mean review and evaluation and may include ongoing communication to stakeholders – answering FAQs, promoting the benefits of training programs, etc. Finally, work to ensure that there are relevant ongoing strategies in the organisations strategic planning documents and appropriate resources committed in operational plans. An expanded section dealing with quality assurance is included in the Training Program Toolkit. Keeping records of what was done and how it was done is important for the next time a review is undertaken. Make sure that anyone who picks up the baton in the future, be it yourself or someone else, can quickly find relevant documents and understand the process. Make succinct recommendations for doing it better next time. If and when you leave the organisation or take on a different role, it will be your responsibility to do a handover to the next person. You want to leave a legacy of your good work, and part of this is ensuring that the good work is continued. Make it easy on yourself by keeping good records. It is also good business practice to make sure that another person in the organisation is fully briefed and has preferably been involved in the project. With some preliminary thinking about the development and implementation challenges behind you, it is time to move onto the Training Program Toolkit. This will be your next port of call as you contemplate the fine detail of developing a suite of quality training programs for your coaches and officials. The Training program toolkit toolkit has been designed to support NSOs develop their training programs. Quality training programs are essential if NSOs want to recruit, train, support and retain their coach and official workforce. This toolkit has been designed to support NSOs develop their training programs. Quality training programs are essential if NSOs want to recruit, train, support and retain their coach and official workforce. Many NSOs have exceptional capacity when it comes to developing world-leading coach and official training programs. This toolkit can help these NSOs to continue to improve their programs and remain world-leading for many years to come. Sport Australia receives many requests from NSOs seeking assistance to develop their training programs. This toolkit will help these NSOs build capacity within their organisations and effectively lead the development of their coaches and officials nationally, now and in the future. This toolkit has been designed for NSOs to move through in a logical manner. Developing an effective coach and official training program can be a daunting task and the most difficult or confusing part can be knowing where to start. This toolkit takes the confusion out of the process and help NSOs develop the training programs they need. Developing your NSO's training programs - the big picture! Developing your NSO training programs - the big picture! There is a saying that ‘form follows function’. When thinking about designing a coach and official training program, you need to be clear about the program’s purpose (or function) before you start thinking about what form it will take (i.e. which modules or content to include, how it will be delivered and assessed, etc). Participants first! Who will the coaches or officials be working with? Be clear about the needs of the participants before you do anything else. You need to understand their stages of development, physical, technical, tactical and psycho-social characteristics and support needs, types of competition, etc. This should align with your NSO's Coach and Official Development Framework. Who are the coaches and officials supported by the training program and what skills do they need and want? This should align with your NSO's Coach and Official Development Framework. Develop competency statements. Competency statements are broad descriptions of the primary functions of your coaches and officials operating in specified environments. Develop performance standards. Performance standards are measurable statements that describe the level of performance needed for a coach or official to demonstrate they have achieved the broad competency / competencies. Develop user-friendly assessment tools with a focus on both assessment for learning, as well as assessment of learning. Choose the most effective delivery models and identify the delivery implications these will have. These could include face-to-face theory sessions, practical ‘in-situ’ coaching, e-learning (e.g. ASC Community Coach / Introductory Level Officiating courses), blended learning, modular delivery, integrated coaching principles or separate, mentoring, etc. Find or develop relevant and engaging learning resources to help coaches and officials be ready to successfully complete assessment tasks. How will you know if the training program is achieving its purpose? What is the purpose of the training program? Learning occurs where there is a need and the need has been accurately identified. People sometimes participate in training that is irrelevant to their interests, their skill sets, or the requirements of their coaching and officiating environments. When this happens, learning is unlikely to occur. It is important to develop a coach and official training program that meets the identified needs of the learners (i.e. coaches and officials working with participants in specified stages of development and in specified environments). For example, a coach or official operating with ‘beginner’ level participants will need different skills than one operating in the high performance environment. The following table is a sample approach of what you can do. Who will the training program participants (coaches and officials) be trained to work with? Refer to your NSO’s participant map – ‘Know Your Participants’ — and identify the category of participants the coaches and officials will support. Please provide a brief overview of the characteristics and needs of participants in this stage(s) of development. (e.g. physical, psycho-social, technical, tactical, etc.) and Participant needs. Refer to Framework Toolkit for some examples. What are the ideal attributes for coaches at this level? Have a sense of working in a wider coaching community. What do the coaches and officials need to be able to do? What is a competency statement? Competencies describe the primary functions of coaches and officials operating in specified environments. Now you have a sound understanding of your NSO’s participant map, you in a great position to identify (broadly speaking) what coaches and officials should be able to do. They will need to be able to effectively support the developmental needs of the participants they are coaching or officiating. Remember, to develop the competencies for your sport you need to refer to your NSO’s participant map, understand the characteristics and needs of the participants in the relevant stage(s) of development and broadly articulate what coaches and officials need to be able to do to support these participants. Another thing to remember when developing competency statements is ‘less is often more’. Keep them broad and don’t develop too many. For example a coach and official training program might only have five or six competency statements. How will coach and official practical skills be measured? Performance standards are measurable statements used to generate evidence about how a competency is displayed when the coach or official performs well on the job. These are used by assessors to measure a candidate's performance against each competency. In the past, NSO’s training programs usually included a number of ‘learning outcomes’ for each module. NSOs are encouraged to incorporate performance standards into their training program instead of learning outcomes, because learning outcomes are often knowledge-based rather than performance-based. Performance standards refer specifically to what the coach or official will actually need to demonstrate in practical environments. "Performance standards are not about measuring what a training program participant knows, but are about seeing what they can do". Participants will know how they will be assessed. Participants will see the relevance of the learning activities they engage in before they are assessed. Participants will see that the focus of their training program is to develop their practical coaching and officiating skills, not their ability to recall information. Participants will be aware of the performance expectations of coaches and officials operating in the specific environment (i.e. the types of behaviours the NSO expects them to exhibit after they complete the training program). Assessors will be clear about how they are to measure the performances of participants during assessment (i.e. what they need to see the coach or official do). NSOs will choose delivery models and assessment tasks and design learning resources in a manner which will most effectively help participants demonstrate the performance standards (and therefore be a skilled in their role). The opportunity for play, fun and interaction with others. How will your training program participants be assessed? Assessment should NOT be seen as a hoop that learners (and assessors) have to jump through or something that just has to be done to get a certificate. If this is how your assessments are perceived, then something is wrong. relate specifically to what the coach or official needs to be able to do AFTER they have completed the training program. Review the number of performance standards to see how many are contained within the training program. How many assessment tasks do you think you will need to develop in order to assess all the performance standards? Remember, sometimes LESS is more! Do any of your current training programs use an exam as a method of assessment? If so, could there be a better way? When choosing the best assessment methods to use, there are three simple questions you can ask. Answer yes to the three questions below and you can be confident that the assessment method or task you have chosen is going to be effective. Will the assessment task collect direct evidence? Will the assessment task collect evidence which is valid, current, sufficient and authentic? Evidence is the information which, when matched against performance standards, demonstrates a learner’s competence. There are three types of evidence which can be collected via assessment. Direct evidence is the most accurate form of evidence. It is obtained when an assessor observes the coach or official’s actual performance in a real setting (e.g. on-the-job). Video footage of a candidate coaching or officiating in a real setting is classified as direct evidence. Indirect evidence is used when it is not feasible to gather direct evidence (e.g. too costly, dangerous, time consuming). Role plays and simulated activities are classified as indirect evidence. First Aid courses are an example of when it is usually more appropriate to collect indirect evidence. Supplementary evidence is the least reliable form of evidence. This involves the assessor inferring the candidate’s competence without having seen this demonstrated in a real or replicated environment. Common examples of supplementary evidence are CVs, references, letters of support, etc. What is valid, current, sufficient and authentic evidence? Note – one assessment task can align with multiple competency statements. Note – one assessment task can (and should) assess with multiple performance standards. A broad outline of what the coach or official will need to do to successfully complete the task (e.g. plan, deliver and review 2 x 1 hour coaching sessions designed to meet the needs of beginner level participants. How will your training program be delivered? Please re-visit your NSO participant map (Step 5 – Develop your learning strategy) and look over the broad delivery model your NSO plans to use for the training program. Why does your NSO deliver its coach and official training program in the way it does? Is it because it’s always been done that way? Could there be a better way? Right now is the chance for your NSO to really think about the best way to deliver the training program and the implications of this for your NSO and its delivery agencies. they experience some success and gain ongoing feedback that builds their self-confidence. Your challenge is to choose coach and official training program delivery models that create positive learning environments and meet learners’ needs and motivations. Formal learning is always organised and structured, and has specific learning objectives. From the learner’s standpoint, it is always intentional (i.e. the learner’s explicit objective is to gain knowledge, skills and/or competencies. Non-formal learning is somewhat organised and can have or be linked to learning objectives. The advantage of non-formal learning lies in the fact that learning may occur at the initiative of the individual but also happens as a by-product of more organised activities, whether or not the activities themselves have learning objectives. In coaching and officiating, the context might include clinics, conferences, or seminars. Informal learning refers to when coaches and officials initiate their own learning, choose what they want to learn and decide how they wish to learn it. Much of this learning is done on the job. Other examples of informal learning are reading a book, watching a DVD, watching another coach or official in action, and reflecting on prior experiences. It is important to remember that your NSO’s coach and official training program can (and probably should) have all three of these learning situations embedded in its design. If you are interested, visit the Sport Coach UK — Coach Tracking Study and formal versus informal coach education links to read about the pros and cons of formal and informal coach education. Note that research suggests that there is a growing shift for coaches to want to undertake more informal learning. Like a lot of NSOs, British Swimming realised the importance of informal learning in the development of coaches and officials, however they struggled to know how to integrate this into their formal coach and official accreditation programs. The British Swimming Workforce Development Team did some research into a range of web-based learning systems which they could potentially use to recognise the informal learning experiences their coaches and officials were engaging in on a daily basis and the competencies they were developing as a result. The team found a simple and inexpensive web-based learning system that allowed all of their currently accredited coaches and officials, and those enrolled in formal training programs, to upload information relating to the informal, non-formal and formal learning episodes, into what are known as e-portfolios. In order for Colin to have this very valid evidence formally recognised against relevant performance standards in the British Swimming Level 3 coaching qualification, all he had to do was insert a short description of the chat he had with the other coach, what he learnt and how he was now applying this, into his e-portfolio (or upload a pod-cast / video recording of the chat). Colin also included the contact details of the strength and conditioning coach and the swimmer recovery program he developed following the chat, into his e-portfolio. At any time during Colin’s Level 3 studies, his assessor can access his e-portfolio (Colin needs to give the assessor access) so relevant evidence obtained via informal learning episodes can be used to formally assess Colin against relevant Level 3 coach performance standards. face-to-face practical workshops (i.e. largely simulated practical coaching and officiating environments. How should the training program content be organised? Which modules (or chunks of learning) should be included? How much text, audio and / or visual information should be included? What types of learning activities should be included, and how many? When developing the learning resources for a training program, a key consideration is the preferred learning styles of the coaches or officials the training is designed for. Although you can’t know how every potential participant prefers to learn, you can assume that the majority of coaches and officials will prefer to learn via lots of visual and practical resources and activities. So what does this mean for the learning resources you are developing? A simple learning resource development process which will be effective for learners with various preferred learning styles is presented below. Remember, apart from being a really interesting and engaging experience, the learning resources you develop need to prepare the learners for assessment (if you are developing training programs which incorporate assessment). Therefore, when deciding on modules, content and activities, think about how the learners will be assessed and make sure the content will help them successfully complete all assessment tasks. How will you know if the purpose of your training program is being achieved? Remember Section 3 of this toolkit —What is the purpose of the training program? This was the first step in designing your new training program and potentially the most important. Although most NSOs are quite clear about the purpose of each of their coach and official training programs, what many are not so clear about is how effectively this is being achieved. If you refer to the ‘Know Your Workforce’ section of your NSO’s Coach and Official Development Framework, you will be aware of how many coaches and officials are required in different environments, and the types of participants and athletes they need to work with. Over time, it should be fairly simple for your NSO to measure its progress against these quantitative goals. However, measuring the impact of training programs should involve more than measuring numbers. "Apart from quantitative measures — numbers of trained coaches and officials — how does your NSO measure the impact that its training programs are having on the quality of coaching and officiating throughout Australia"? Surf Lifesaving Australia initiated two key independent reviews in 2012 —the Surf Sport Coach Development Framework Review and the Surf Sport Official Review. These reviews were comprehensive and designed to allow SLSA to make evidence-based decisions regarding the future of its coach and official development frameworks. “The evidence collected during the reviews, especially that collected from our current (and past) coaches and officials, really motivated us all to make comprehensive change. In essence, the training programs were not doing what they were designed to do, i.e. they were not positively impacting on the post training behaviours of our coaches and officials in a significant way". “Following the reviews, we now have a totally re-vamped, contemporary coach development framework and suite of coach training programs up and running. We also have a new official development framework and are currently working on the development and roll-out of the new officiating training programs". British Swimming (like most UK NSOs) had a well-supported United Kingdom Coaching Certificate (UKCC) registered coach accreditation system in place. The number of accredited coaches at all levels and in all environments rose year on year between the inception of the UKCC training programs in 2007 and 2010. What British Swimming did not know, was how effective their UKCC training programs were in influencing coach behaviour. British Swimming used a software application called the Coach Analysis Intervention System (CAIS) to analyse the coaching behaviour of 25 randomly selected, qualified level 1 coaches before they underwent the Level 2 UKCC training program and then after they completed the Level 2 training program. Having progressed through sections 1–9 of this toolkit you should be really pleased with the quality of the training program you have developed but as you know, supplementary policies and procedures need to be in place to ensure the quality roll out of national training program. Note: Once developed, these policies and procedures can apply across all coach and official training programs within your NSO’s Coach and Official Development Framework. They should only need to be developed once. What can we do to ensure quality delivery? Too often, putting a training program quality assurance process in place is something we think is a good idea but never quite get around to implementing! The lack of availability of resources is one reason for not attending to this important aspect of implementation and continuous improvement. The following suggestions are measures that won’t break the budget or take too much time. – how easy was it for the coach or official (before, during and after)? Do I feel more confident to coach or officiate? Engaging delivery strategies with a strong emphasis on DOING and a good integration of face-to-face, online and practical experience activities How well has the course / training program equipped me with useful skills and knowledge? Assessment is transparent, contributes to learning and measures actual competencies Has the training program equipped me to APPLY new skills and knowledge to my immediate coaching or officiating situation? Would I recommend the training program to a friend? coach and official behaviour change (refer to section 9 of this toolkit).